When in India, be sure to be greeted with a lot of folded hands and temple worship. The temples in India are famous for their ancient form of architecture. This is the grandeur that one witnesses at Madurai in South India. 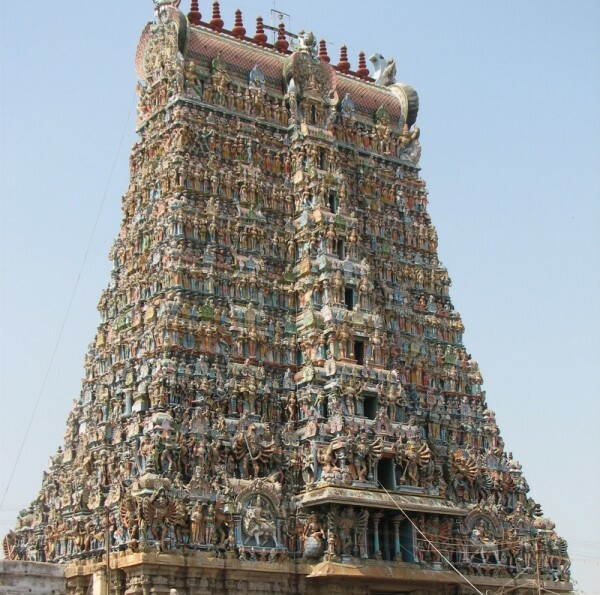 Madurai is synonymous with the presiding deity here Goddess Meenakshi. The River Vaigai gurgles along Madurai, the land of culture and art. Existing from as far as 550 AD, this was the capital of the Indian Pandyan kings. History has been witness to King Kulasekarar building a temple here and a city around it in the shape of a lotus. It is believed that the Indian God Shiva blessed this land the day it was being named and showered lot of nectar. Thus it was named Madurai as nectar is referred to as Madhu in Sanskrit. The fragrance of jasmine flowers as its main feature this city has been a historical witness to attacks from outsiders and has survived major attacks thus emitting its powerful vibrations even now. The temple being the mainstay of this very ancient city Madurai and the streets that run along the city with the temple in the centre is very symbolical of the cosmos. In the 3rd century BC Megasthenes visited this city after which there were many foreigners who got interested in Madurai. The Madurai temple is a huge complex and the presiding deity Meenakshi and Lord Shiva are worshipped fervently by devotees. With its high walls and the innumerable pillars here the temple is an impressive structure with magnificence beyond comparison. The 12 towers soar high in the sky and the sculptures here are so intrinsically carved that they seem to come alive as we walk through the sanctum. There is a hall here built by Thirumalai Nayakar the king for his wives and this was where food was distributed in ancient times. The sparkling lamp with 1008 lit lamps is a phenomenal sight. Legend says that the king of Madurai had no children and finally got a child through a sacrifice in fire and this girl fell in love with the Indian God Shiva in the form of Sundareswar and she got married to him. The couple was Goddess Meenakshi and Lord Shiva. This temple is also replete with 110 pillars which are shown to be carrying the strange figures like a lion’s body, an elephant’s head etc. The huge tank here besides the swing, a parrot cage are all major attractions in the temple. People coming here also are enthralled to see the stump of a tree which is believed to have been worshipped by the Lord Indra the God of Heaven. The dancing Shiva or Nataraja covered with silver leaves is also a unique feature here. There is a 1000 pillar room where each pillar emits vibrations and a musical note as we strike them. With Chennai, Tiruchi, and Bengalooru as the nearest airports and Madurai as the nearest railway station, this wondrous city is also accessed by road. So come to this wonderland and feel pure.